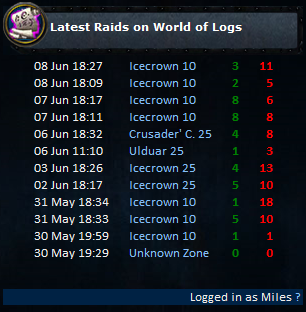 World of Logs - Tutorial - How to add widgets to your guild page? The HTML tag is what most of you will use. Just adjust the width and height, but remember to disable extended stats if the width is below 200px. This version must be used if the HTML is "cleaned up" by the CMS, for example, in the Guild Launch HTML Widgets. To create a widget on the sidebar, first, go into widgets mode with the link on the upper right, and click "Add Widget Left" or "Add Widget Right". Pick Misc. Widgets -> HTML Widget, and click Add widget. In the empty block, click the edit content (pencil) button, click the "HTML" button on the editor and paste the tag into it. 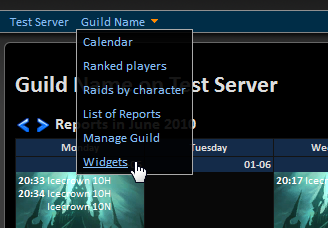 By default, only publicly accessible reports are shown, but if you're logged in, you'll have access to all the data in your guild.